ELBRIDGE, N.Y. (JULY 10, 2017): Indian Motorcycle Racing and the Scout FTR750 captured its ninth win of the American Flat Track season at the Rolling Wheels Half-Mile. Indian Wrecking Crew riders Jared Mees and Brad Baker finished first and third, respectively, tallying 23 of 30 podiums for the Scout FTR750 in 2017. Mees’ victory reclaimed the points lead over on-track rival and fellow Wrecking Crew teammate Bryan Smith, as the two continue to exchange leads throughout the season. Mees and his Scout FTR750 outraced the entire field and passed the checkered flag nearly five seconds before the second-place finisher. 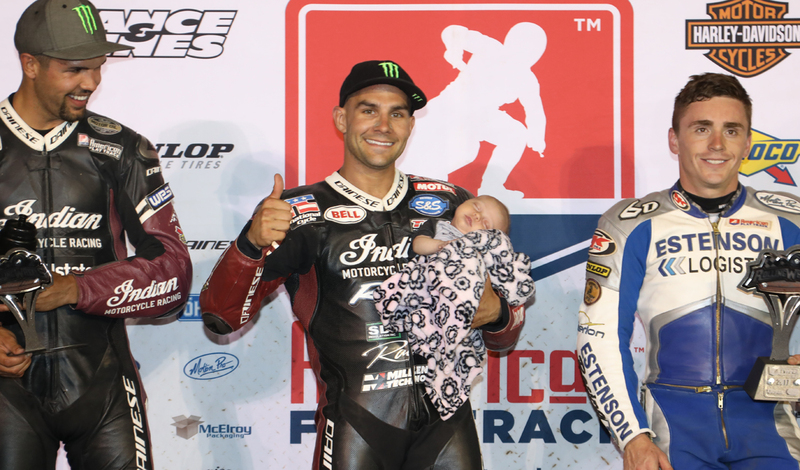 With his fifth win of the season, Mees recorded his first career in-season Grand Slam, winning a TT, Short Track, Half-Mile and Mile, an accomplishment only three others have achieved in the history of the sport. Through 10 races this season Mees and Smith own nine of the first-place finishes. The two Wrecking Crew riders have been battling for the top points position all season long. They have leap-frogged each other the last three races since being tied in total points following the Red Mile. Mees currently sits eight points ahead of Smith, 202 to 194. While Baker earned his seventh podium of the season and remains third in total points with 149. Indian Motorcycle Racing, backed by Allstate Insurance, will look to continue its incredible run as American Flat Track heads to the Calistoga Half-Mile at Calistoga Speedway in California on July 29.